My new book with Brett Campbell, Lou Harrison: American Musical Maverick, is now available. Brett and I also maintain a blog of Harrison topics. Rational Basis for 8 electric guitars, performed by the Los Angeles Electric 8. 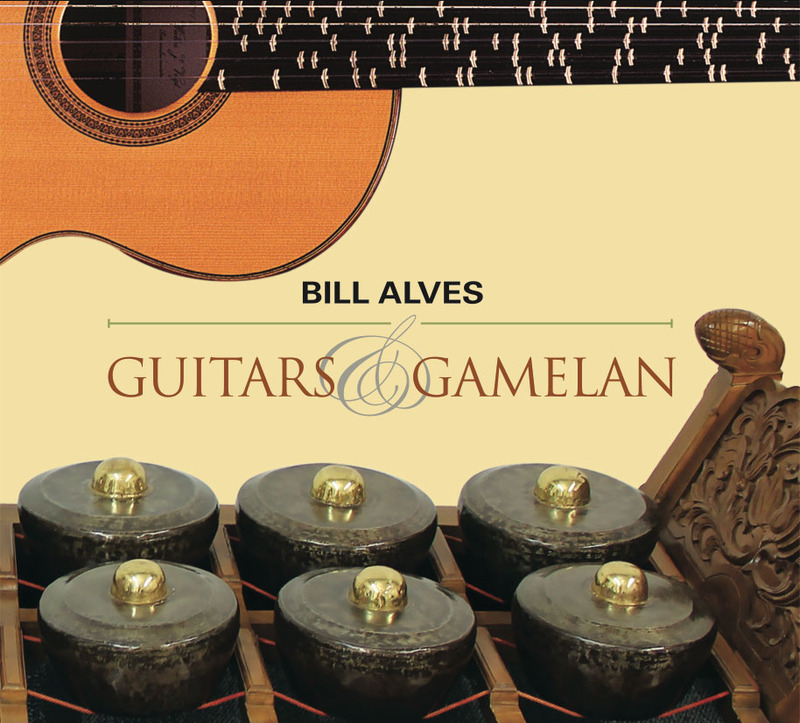 Angin Listrik for Balinese gamelan and 2 electric guitars, performed by Sean Hayward, Nat Condit-Schultz, and Gamelan Swarasanti. Now available at MicroFest Records, Amazon, iTunes, and elsewhere. Feb. 24, 2019: Brightwork newmusic premiered my Night Refuge for chamber ensemble with electronics and video at Harvey Mudd College. The suffering of refugees inspired this new work, which includes processed and edited sounds from refugees and video depicting their exile. Feb. 10, 2019: Thanks to the Stephen F. Austin Percussion Ensemble for performing my Gandrung at the Texas Music Educator's Convention in San Antonio. Feb. 1, 2019: Maggie Parkins performed resonant halls of memory for cello with live computer processing at Pomona College's Ussachevsky Festival of Electronic Music. Jan. 23, 2019: I participated in the Postclassical Ensemble's event titled Cultural Fusion: The Gamelan Experience at the Washington National Cathedral in Washington DC. This remarkable concert included two gamelan from the Indonesian Embassy, orchestral works by Lou Harrison, and other works inspired by the Indonesian Gamelan. The program included my own Black Toccata for piano, four hands, performed by Benjamin Pasternack and Wan-Chi Su. I also gave a talk, via video with the assistance of the Indonesian Embassy Javanese Gamelan, about the relationship of Javanese gamelan and the Lou Harrison Concerto for Piano with Selected Orchestra. Dec. 15, 2018: Thanks to Amy Barston and her students at the Juilliard School in New York City for this video of their great performance of my California Mabommay . Dec. 10, 2018: Aron Kallay performed my Skala-Niskala, a concerto for retuned piano and Balinese gamelan with the Pomona College Gamelan Giri Kusuma. Nov. 2018: Rachel Rudich performed my In-Yo for shakuhachi and electronics at Ryogoku Monten Hall in Tokyo. Nov. 16 & 17, 2018: My abstract video with music Stellation was projected as part of the Concierto de Música Visual en Fulldome - UVM at the Galileo Galilei Planetarium, Buenos Aires. Sep. 2018: The Varied Trio performed my Five Gamelettes for violin, piano, and percussion at Occidental College. Sep. 2018: I gave a presentation on John Cage in Claremont, California for a symposium on Cage@Claremont hosted by the library of the Claremont Colleges. You can read a version of my presentation here. June 2018: The City of Bremen Gamelan performed my Gending Vogel Flats for violin and Javanese gamelan at the Munich Stadtmuseum as part of the Internationales Gamelan Musikfestival München. June 2018: Mary Chase Doll premiered her choreography to my Breath of the Compassionate at the Laban Institute in New York City. June 2018: Jaclyn Wappel presented a paper on my Concerto for Harp and Gamelan (which she has also performed) at the American Harp Society National Conference in Redlands, California. At the same conference, I gave a presentation on "The Harp and Lou Harrison." You can read a version of the presentation here. May 6, 2018: As part of MicroFest 2018 Mak Grgic and Brian Head premiered my Slim Pickings for two retuned National Steel guitars. These instruments were originally designed for Lou Harrison, who devised an 11-limit just intonation scale for them. Apr. 2018: Rachel Mayeri's film Orfeo nel canale alimentare [Orfeo in the Alimentary Canal], for which I composed the score, was featured at Vienna's' Universität für angewandte Kunst and the Viral Culture Symposium in Claremont. It also appeared at Perth's' Art Gallery of Western Australia and Old Customs House in Fremantle, Washington. Apr. 22, 2018: As part of MicroFest 2018 the HMC American Gamelan performed works by Lou Harrison, along with my At First Light and Liminal Lanscape for gamelan and video. The program also included David Doty's suite for retuned tack piano and Greg Schiemer's work for many microtonal iPhones. Apr.-May, 2018: The Claremont Concert Choir performed "A Sonatina" from my Three Songs of Gertrude Stein with soprano soloist Tessie Prakas. Mar. 2018: I spoke on a panel on Global Links in the Performing Arts at the South Asia Studies Association National Conference. Coincidentally, Aron Kallay performed my Paths of the Wind, which I spoke about, at the Soundwaves series at the Santa Monica Library. Feb. 2018: The Varied Trio premiered my Five Gamelettes for violin, piano, and percussion at Harvey Mudd College. Feb. 2018: On Optimism, my electronic score for a collaboration with choreographer Kevin Williamson, poet Warren Liu, and artist Kaspar Kovitz, premiered as a part of Artsmooch at Scripps College. Dec. 2017: Maggie Parkins premiered my resonant halls of memory for cello with live computer processing at Harvey Mudd College. Oct. 2017: Rachel Mayeri's film Orfeo nel canale alimentare [Orfeo in the Alimentary Canal], for which I composed the score, premiered at the Imagine Science Film Festival in New York City as a part of Chimera Experiments. Sept. 2017: Kirsten Ashley Wiest performed my "A Sonatina" with text by Gertrude Stein with pianist Nic Gerpe at the unSUNg concert series in Pasadena. She has also performed it at recitals at Harvey Mudd College, Pasadena City College, Chapman University, and Tuesdays @ Monk Space in Los Angeles. You can see her performance with pianist Nic Gerpe here. June 2017: I delivered the keynote address about composer Lou Harrison at the CeLOUbration at Portland State University. 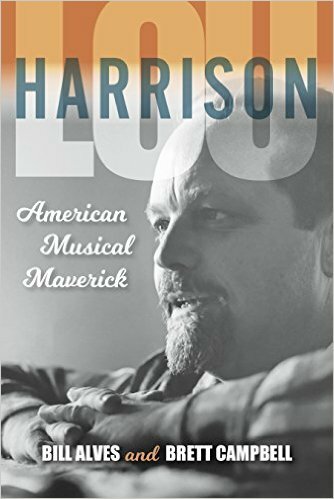 May, 2017: Our book Lou Harrison: American Musical Maverick received positive mentions on NPR, The New Yorker, the LA Times, 4Columns.org, Tempo and elsewhere. I spoke on the air on Bill McGlaughlin's syndicated radio show and KPFK's Global Village. Brett and I were guests and forum participants at the celebration of Harrison's music at New Music Works in Santa Cruz. Apr. 23, 2017 My Angin Listrik for two electric guitars and Balinese gamelan was performed at the University of Tennessee Knoxville. Mar. 27, 2017: I was happy to be a guest of the Robb Composers' Symposium at the University of New Mexico, where my Sounds Ineffable was presented. Feb. 12, 2017: Gamelan Dwara Udyani of Denison University, Ohio, premiered my Gending Swallowtail with violinist Andrew Strietelmeier as part of the Tutti Festival. Feb. 3, 2017: BrightWork New Music ensemble performed my he watches the clouds pass the window at the Ussachevsky Memorial Electronic Music Festival. They will repeat the program in Pasadena on Feb. 25, sponsored by People Inside Electronics. Nov. 27, 2016: My String Fields for violin and live electronics was presented as part of the Csound 30 Conference at the National University of Ireland, Maynooth. Oct. 23, 2016: BrightWork New Music ensemble premiered my he watches the clouds pass the window for violin, retuned cello, keyboard, percussion, and electronics. Oct. 2016: I released the new version of my Just Intonation Ear Trainer. This web-based software will allow you to quiz yourself on just intonation musical intervals. April 24, 2016: The HMC American Gamelan performed as part of MicroFest works by Tom Flaherty, Daniel Schmidt, Lou Harrison, John Cage, and me, including my Gending Sycamore Canyon for violin and gamelan and my Breath of the Compassionate for gamelan and computer projection. March 4, 2016: The HMC American Gamelan performed works by Lou Harrison, John Cage, and me at Pasadena's Boston Court, including my Gending Sunset Ridge for violin and gamelan and my Breath of the Compassionate. Feb. 5, 2016: Violinist Sarah Thornblade performed my String Fields for violin and live electronics at the Ussachevsky Memorial Electronic Music Festival. December 1 and 4, 2015: My Ite Missa Est for choir and electronics was premiered by the Claremont Concert Choir. November 9, 2015: My Breath of the Compassionate returned to the wonderful dome projection on the Planetarium of Buenos Aires. November 1, 2015: As a part of a special concert titled "Awakening to the Environment" at Scripps College, the Claremont Chamber Choir premiered my Li Po Declines with text by Scripps poet Warren Liu. October 25, 2015: Gayle Blankenburg and Stephanie Aston will premiere my "A Sonatina" with text by Gertrude Stein at Harvey Mudd College. Also on the program, my Black Toccata and works of Richard Cameron-Wolfe. September 2015: Aron Kallay performed my Paths of the Wind at the University of Honolulu. July 25, 2015: People Inside Electronics presented Aron Kallay in a program that included my Paths of the Wind for retuned piano. You can read a review here. June 26, 2015: The National Cello Institute commissioned a new work for their 40th anniversary, my new Pipes and Bridges for cello orchestra. Over 80 cellists (and one organist) performed the work at their finale concert. Earlier in the week, faculty performed my California Mabommay for 8 cellos, written for NCI's 20th anniversary. April 26, 2015: MicroFest presented the HMC American Gamelan in works by Lou Harrison and me, including the premiere of Gending Sunset Ridge for violin and gamelan and Elegy for Lou Harrison for cello and gamelan. April 2015: Aron Kallay performed my Paths of the Wind for retuned piano in a tour of seven concerts in Alabama, Georgia, and North Carolina. April 2015: The Ethos Percussion Group performed my Gandrung iin a tour of several concerts in New Mexico and Oregon. March 8, 2015: Anne Harley premiered by Sound Ineffable for soprano and live computer processing at Scripps College. March 5, 2015: The Los Angeles Percussion Quartet performed at Harvey Mudd College, including my Gandrung. February 2015: Harpist Jaclyn Wappel performed my Concerto for Harp and Gamelan at Ball State University in Indiana. In April, she repeated the performance at Earlam College. 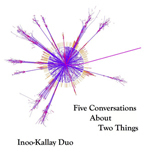 November 11, 2014: The Inoo-Kallay duo released a new recording of my The Question Mark's Black Ink on their CD Five Conversations About Two Things (Populist Records) along with works by Thomas Osborne, Karl Kohn, Caroline Louise Miller, and Tom Flaherty. You can read reviews here and here.